Navman has announced its new S-Series satellite navigation models with a host of user enhancements that go, it says "beyond navigation". Indeed, the company reckons it has made over 500 changes to the models including adding a mileage tracker, SOS function, Bluetooth mobile integration and even the ability to navigate to geotagged Flickr photos you download. The 4.3-inch screened S90i model is also 20 per cent slimmer than any other satnav kit in its class, according to the company. The ability to take a picture using the built-in camera and tag it with a grid reference isn't new to Navman. But you can now share your 'NavPics' online as well as download locationally-tagged Flickr images to your satnav using the NavDesk PC software. Navman says its ideal for locating non-address specific locations such as a beach or forest. Navman's Colin Holloway is confident the market will grow and says that competing devices aren't eating into the market. "Competition from smartphone brands doesn't really seem to be having impact," he said. Moreover Holloway predicts that by 2008, more than half the devices sold will be to people replacing older models. 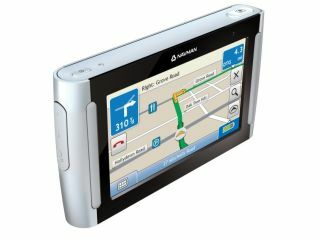 Navman carried out major research into how people use satnav devices and what they want from them. "One of the things you'll notice is we've taken the buttons off the front," said Holloway, implying that this makes the device less scary to use. The company has also gone for big friendly menus, bevelled edges and it has changed the cradle so it can be easily stowed. Among the other enhancements to the S-Series is PIN code security, spoken road names and directional speed camera information - so it only warns you if the camera is on your side of the road. It will also only warn you about cameras if you are near or over the speed limit in that area. As for pricing, it starts at £149 for the 3.5-inch S30 with UK and Ireland mapping and £179 for the S50. The S70 and S90i (£199 and £299 respectively) both have European mapping.